Without doubt the real jewel of an Turas is St Colmcille's holy well. The conditions on my visit could not have been more favourable. As I walked up from the chair, I could see the stones of the cairn glistening in the morning sun. My first thought was one of excitement, the white cairn looked beautiful sitting in a small cirque halfway up a mountain. WOW ! 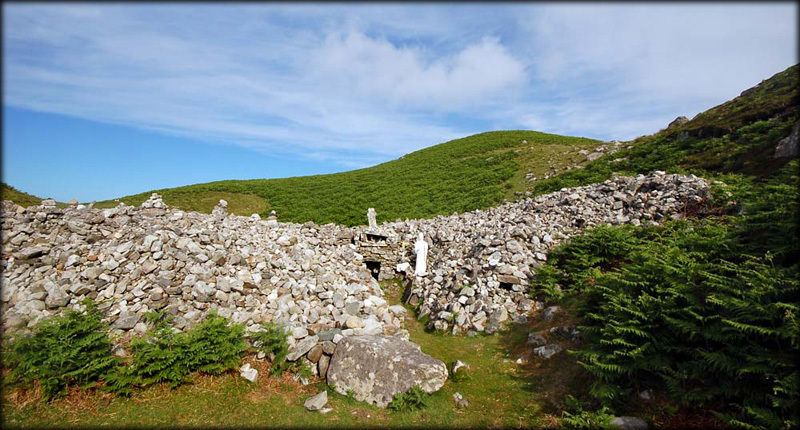 What an incredible site, the L-shaped cairn is over 30 metres long with a path to the well cut into the cairn. Sitting on top of the well head is a crude looking cross with small arms, but the west face is beautifully decorated. Lying on the cairn is a beautiful cross slab, but sadly lying on the ground near the cairn is a similar broken slab. According to tradition the pilgrims would carry up the hill three stones, one for each circuit of the well and then place them on the cairn, which has greatly added to the size of the cairn. They would throw three drops of water in the name of the holy trinity and then drink the water. I am so delighted to have seen this wonderful site on such a beautiful day. 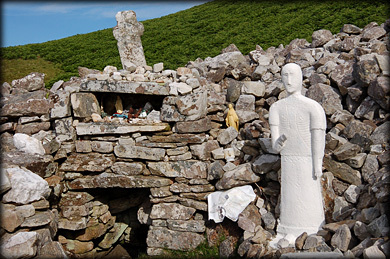 If you do visit Glencolumbkille make sure you visit the well, you will be rewarded for your efforts. From here the pilgrim would head east south east down Malaigh na Cainnte (the slope of conversation) the only place where talking is allowed, across the marsh to station 8. 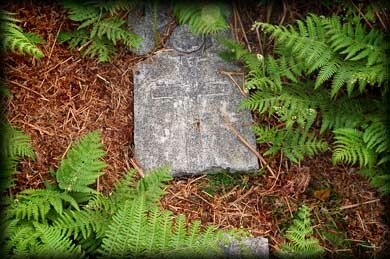 We have no images yet from station 8, so our journey continues from Farranmacbride Court tomb. It is a megalithic site known as Mainnear na mortlaidh (The Enclosure of the Dead). 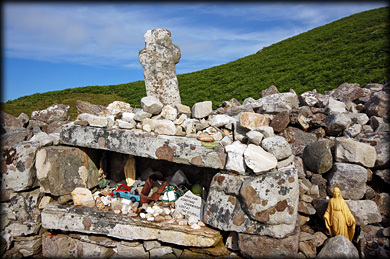 The Pilgrim would pass by this tomb on their way from station 8 to station 9. In Michael Herity's book "Gleanncholmcille" he points out that an ordinance survey of 1847 suggests that the original an Turas may have been centered around St Colmcille's hermitage starting at Station 3 and finishing at Station 7 or 8. This is based on the fact that these stations are geographically distinct from the other stations. Plus all these stations have simple crosses of Latin form, which can be dated to around the sixth century. Most of the other Stations at the eastern end of the valley have elaborately decorated cross pillars. This decoration can be dated to around 700 AD. Situated: From Station 5/6 head north through the farmyard, you may need to seek permission. After leaving the farmyard the road bends left, on your right is a track. Go through the gate up the hill and follow the signs for St Colmcille's well. Alternatively, go back to the fork in the road near station 3. Take a right turn and follow the road to the end. This takes you back to the other side of the farm. Discovery Map 10. G 5242 8611. Last visit June 2010.